Even since the Intel Atom was introduced I have been asking when there would be little green servers for those cases where low power is a higher priority. 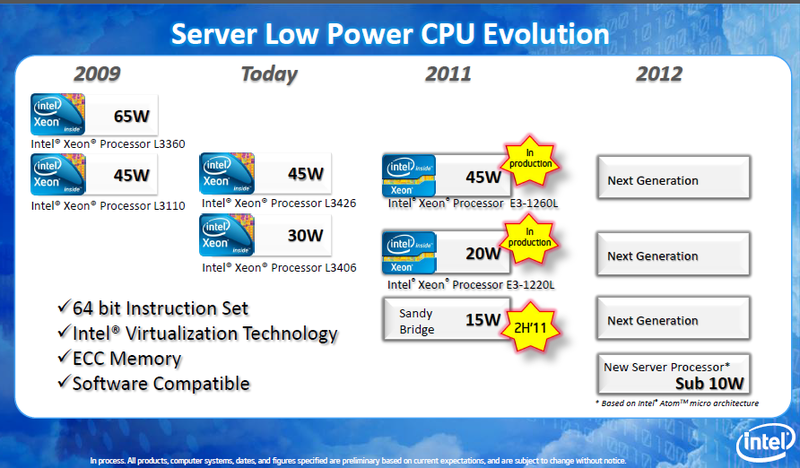 ZDNet covers the Intel Announcement. Intel doesn’t do wimpy chips and made its name pushing performance. But just in case this crazy microserver thing takes off Intel wants you to know it has a master plan. Intel doesn’t do wimpy chips and made its name pushing performance. But just in case this crazy ARM-based microserver thing takes off Intel wants you to know it has a master plan. In a briefing Tuesday, Intel executives rolled out its plan for microservers, small low-power units that are used in large-scale environments deployed by the likes of Facebook. The plan: Release new Xeons that are built for microservers. The Intel news room has a press release. Intel disclosed its roadmap for low-power processors for the emerging micro server category today, including a new server processor based on the Intel® Atom™ processor microarchitecture targeted for 2012. Micro servers share infrastructure resources and are ideal for workloads where many low-power, dense servers may be more efficient than fewer, more robust servers. Intel will deliver four new processors for the category that span 45 watt high performance to sub-10 watt, all with server features including 64-bit, Intel® Virtualization Technology and Error-Correcting Code (ECC). Customers are already planning designs based on these processors, including Intel® Xeon® processors E3-1260L and E3-1220L in production now. With a pdf fact sheet on the emerging micro server category.